« ROAD TRIP: To Tennessee! So did about 80,000 other people. 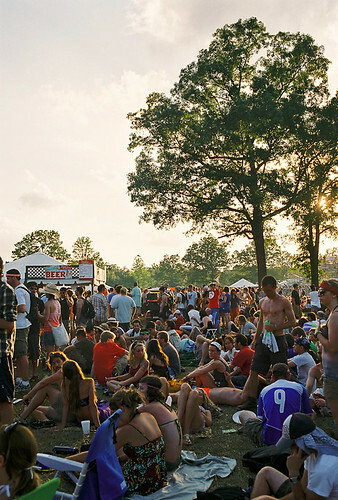 For five days, I escaped the heated bustle and high buildings of the D.C. area, and instead endured the heated bustle and high people at one of the biggest annual music festivals on this continent. To call it a sensory overload would be an understatement of vast proportions. Being one of nearly 80,000 people under the blazing central Tennessee sun, eating the best festival food I’ve ever had and listening to an eclectic assortment of artists — well, it was just wow. 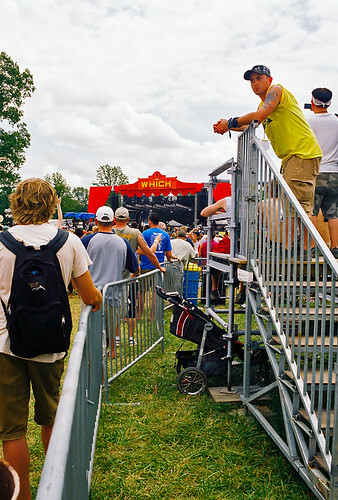 The Bonnaroo lineup this year included headliners Bruce Springsteen, the Beastie Boys and Phish, as well as big acts like Nine Inch Nails, obscure acts like (insert random artist so I don’t offend anyone…), surprise acts like Jimmy Buffett and comedy acts like random Daily Show stars. White Rabbits — What can I say. They’re originally from Columbia, Mo., so of course we had to begin our Bonnaroo experience with them. Delta Spirit — Their set got moved up further in the night, but we were unaware of this schedule change. So we missed them. Portugal. The Man — We listened to them instead of Delta Spirit. Not a bad set. Zac Brown Band — I wanted to hear their set… but it started raining during Portual. The Man. So we headed back to the tent and made it just in time, because then the rainfall and thunderoo really started. 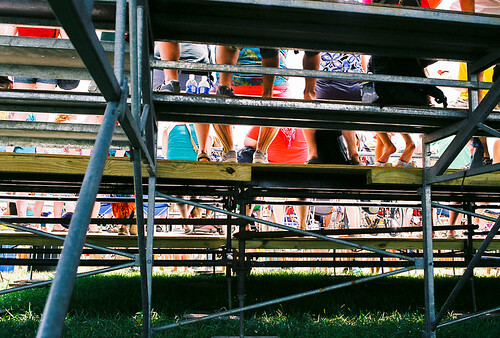 The view from under the bleachers at the Which Stage (second main stage). Trippy? A little. Was I tripping? Hell no. Animal Collective — I don’t remember much of their show, but after reading Kevin’s glowing, under-140-character assessment of their performance in Albuquerque, I was mildly disappointed. Béla Fleck & Toumani Diabate — As always, the banjo-playing was amazing! Galactic with Trombone Shorty and Corey Henry — I’d never heard of any of these artists. But they were playing at the What Stage (the main stage) and gave a great show, and Trombone Shorty crowd-surfed. What more can I say? Al Green — FANTASTIC. The soul singer truly rocked the What Stage, and was the epitome of classiness as he wore a black suit with a red vest and tie in the hot Tennessee afternoon and threw red roses into the audience. Beastie Boys — Their blurb in the Bonnaroo guidebook was full of snark, and they pulled off a great performance with a surprise guest. Phish — All the potheads were excited about Phish — it was all they could talk about in the surrounding tents. I think more people were pumped about Phish than about Bruce (who performed the following night). Girl Talk — I’d wanted to see Gregg Gillis perform, but his was a late-night set (2:15-3:45 a.m.) and I had been nodding off during Phish’s show. So we called it a night about halfway through Phish’s set. So you can’t really tell… but I swear that Jimmy Buffett was playing “Margaritaville” on stage when I took this photo. ILO & the Coral Reefer AllStars, with Jimmy Buffett — Bonnaroo introduced Jimmy as a last-minute addition. He played the latter half of the noontime Saturday show at the Which Stage — and, of course, played “Margaritaville” as the last song. Heartless Bastards — I’m pretty sure I fell asleep during this set… I am strangely narcoleptic, sometimes. Maybe I didn’t. I can’t remember, really. Rodrigo y Gabriela — A man and a woman, armed only with two guitars, on the main stage. Sounds like a set-up for failure, but they pulled off a great show. Jenny Lewis — I’m not familiar with Jenny Lewis as Jenny Lewis — but she did also perform some Rilo Kiley songs. The Mars Volta — Also not a big Mars Volta fan. Oh well. Bruce Springsteen and the E Street Band — BEST SHOW OF THE FESTIVAL. The Boss was truly boss. Entertainment Weekly’s blog post about the show encapsulates Bruuuuuce’s performance better than I can. MGMT — I was nodding off by this point. (The set began at 2:15 a.m.) Jeff was dissatisfied with the set, so we left early. Apparently, their performance improved with time. Oh well. Citizen Cope — I definitely slept during this set. It was good “sit under a tree and take a nap” music — and that’s pretty much what I did. Andrew Bird — Did not fail to impress. I was happy! Snoop Dogg — Snoop was about 30 or 40 minutes late, which had some people grumbling that he was going to pull a Kanye (who was almost four hours late to his set last year). We stayed for a few songs and then left. Band of Horses — Great way to end Bonnaroo 2009. They played all the favorites and then left the stage, only to return for their encore during which they said they would play some new songs. But Jeff and I didn’t stick around for those. 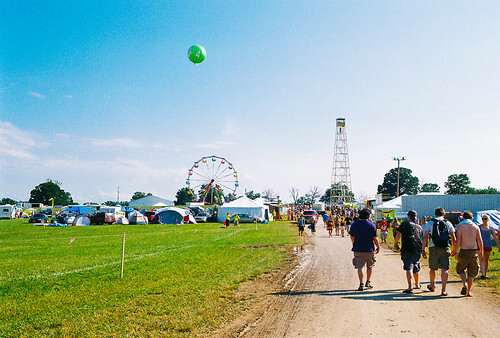 We had the car packed up and ready to go that morning, and after Band of Horses’ first set, we left Bonnaroo. Evening at the Which Stage on Saturday. As for my own experiences and reflections? Well. I’m pretty sure Jeff and I were among maybe 100-200 people who didn’t smoke, get high or drink. As I said earlier, it was a pretty mind-blowing sensory overload — no point in exponentially increasing that overload via alcohol or other mind-altering substances. The hardships: the big thunderstorm the first night, the blistering sun on the subsequent afternoons, the constant and lingering odor of marijuana and tobacco EVERYWHERE, the grimy feeling that Tennessee heat+humidity imparts on your skin. As always, you can view more images HERE. Coming next: On our way back to Silver Spring, Md., we took a very long alternate route through Great Smoky Mountains National Park, along the Tennessee/North Carolina border, and then through North Carolina. I think this alternate route was about four hours longer than our more straightforward journey to Bonnaroo — but it was totally worth it. Blog entry to follow… soonish?